Adding to this site’s archives of combat sports safety studies, important findings were published today connecting reduced brain volume and slower processing speed to the number of years and the number of bouts combat sports athletes endure. 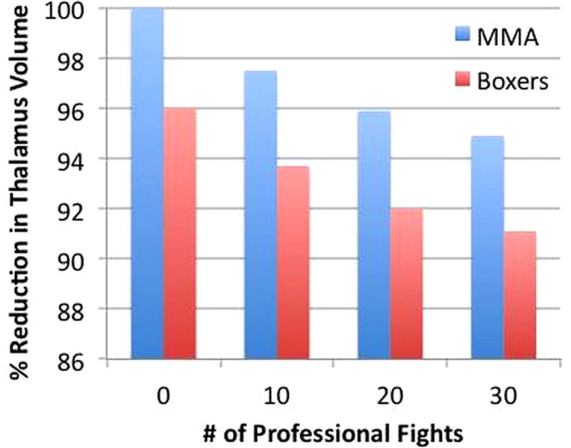 The study concluded that “Greater exposure to repetitive head trauma is associated with lower brain volumes and lower processing speed in active professional fighters.“. The study will follow up with its participants for baseline evaluation on an annual basis over the next 4 years. Given the longitudinal nature of this study important information is expected to be forthcoming in the following years giving far greater insight into the toll of combat sports on the brain.